This is the fourth and last post in my Colors of Summer series. 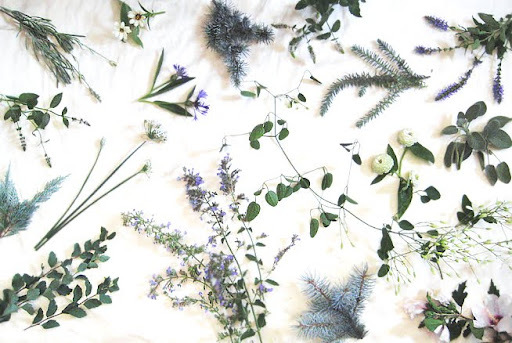 From Left to Right beginning at the top left corner they are lavender 'Fat Spike', zinnia, bachelor button 'Mountain Bluet', Blue Atlas cedar, Kentucky mint, sedum 'Blue Spruce', salvia 'Blue Hill', culinary sage, Liliput zinnia, clematis paniculata 'Sweet Autumn", Rose of Sharon, Blue Spruce 'Montgomery', catmint 'Walker's Low', Vanhoutte spirea, garlic chives, juniper 'Moonglow' and peppermint. I was surprised by the amount of blue I actually have in my gardens. Of course, blue flowers are somewhat rare, but I think particularly lovely. My photograph for example does not nearly do justice to the bachelor's button 'Mountain Bluet', which by the way has bloomed a bit here and there all summer. My favorite blue perennial would have to be the catmint. It has performed beautifully this entire summer despite the heat and drought conditions.